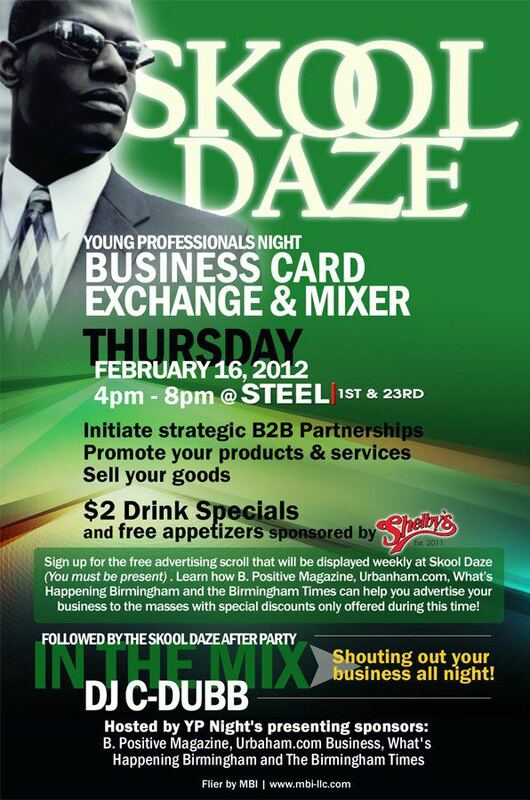 Recently, B.Positive Magazine partnered with Skool Daze, Urbanham.com, What’s Happening Birmingham and the Birmingham Times to bring you YP Night at Steel. This month is our annual Business Card and Exchange Mixer and we need you in the house from 4pm – 8pm networking and sharing information about your businesses. Come and kick off the new year with positive connections. Thursday, February 16, 2012 from 4pm – 8pm at Steel 1st @ 23rd. Initiate strategic B2B partnerships, promote your products and services, sell your goods and more! $2 drink specials and free appetizers sponsored by Shelby’s! Stick around for the Skool Daze After Party with DJ C-Dubb In the Mix and Shouting out your Business All Night! Hosted by B. Positive Magazine, Urbanham.com, What’s Happening Birmingham and the Birmingham Times.